When you’re doing these GPU performance tests against various crypto algorithms, is there any chance you could also test them against oclvanitygen? 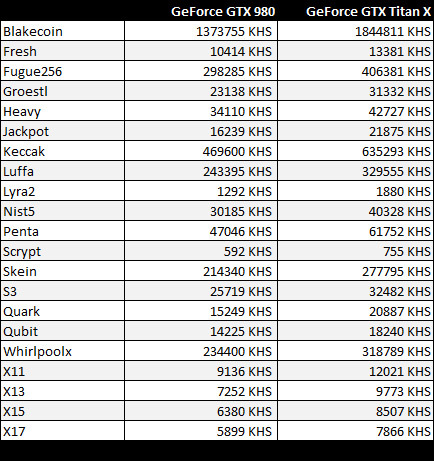 What I find interesting about this benchmark is that modern gfx cards today can now mine scrypt-based coins faster than Gridseed (350-500 KHS) and ZeusMiner Blizzard (1300-1400 KHS). The GTX980 mines Scrypt (592 KHS) faster than a Gridseed silver or gold unit, and Lyra2 almost as fast as a ZeusMiner Blizzard unit. Gridseed and Zeusminer are now outdated in 2015. Well, all I can tell you is that I have been mining with Gridseed and Zeusminer Blizzard units for the whole year 2014. I am now mining with Zeusminer Lightning X6 (42000 KHS) and have taken my Gridseeds and Zeusminer Blizzards offline. This year 2015 I got my electricity bill for the previous year and it is pretty high! Scrypter, Your electric bill would have been MUCH higher if you were GPU mining. I had 5 blizzards last year. the wattage at the all was 250 watts and 6.6-7 MHS. blizzards are about 26 KHS per watt vs this card (gtx 980) which has a tdp of 165 watts gets 3.59 KHS per watt. Something to note. I don’t anyone has really touched on this before and they should look at it. It’s not just about the technology of said cards but in all due honesty, the amount of memory you have on these cards aren’t even being close to be fully utilized. The CCMiner while it’s good, still only handles 4 GB memory with ease, anything more and I’ve noticed the hashrate actually drops (which is bad). The efficiency of this miner needs to be shored up, not so much the algorithms and proof of work, just how the hardware threads and memory is used on the cards themselves. 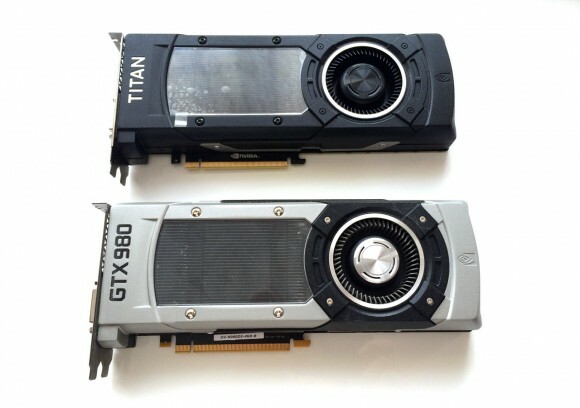 For example if you had a card that had the exact same technology as the 980 and Titan X, had twice the RAM bandwidth with a decent CAS timing on said memory and only had 4 GB RAM, it would kick the crap out of the 980 and Titan X on those mining tests. Having extra CUDA cores doesn’t account for much increase in processing speed as does the overclocking of said cores. Scrypt and forks therein are more a memory bandwidth based process as I’ve said before. Unlike SHA based coins that use the cores more than they do the memory, then the amount of cores and clocking of said cores really makes a difference. Two other things that will skew your tests is whether or not you’re using Stratum, let alone a miner that has Extra Nonce Subscribe (and connected to said server that uses those) or if you’re using the old Getwork system with Long-Poll enabled. You should grab all that data and post that, too. That will give people a better idea of where the problem is and what can be done about it. Also, not all pools use Slush’s reference design of the Stratum protocol, some use a modified version of it, so that it’s compatible but not 100%. That can have an affect on your mining numbers too, make sure you’re mining this from the same pool and also have the same ping timing within +/- 8 ms difference is fine.